Porto Office is located on an open plot with good exposure, on Gen. Bohdana Zielińskiego Street, in a green and quiet part of Krakow, which is within a short, 10 minute drive of the city centre and 3 minutes from the ICE Congress Centre. 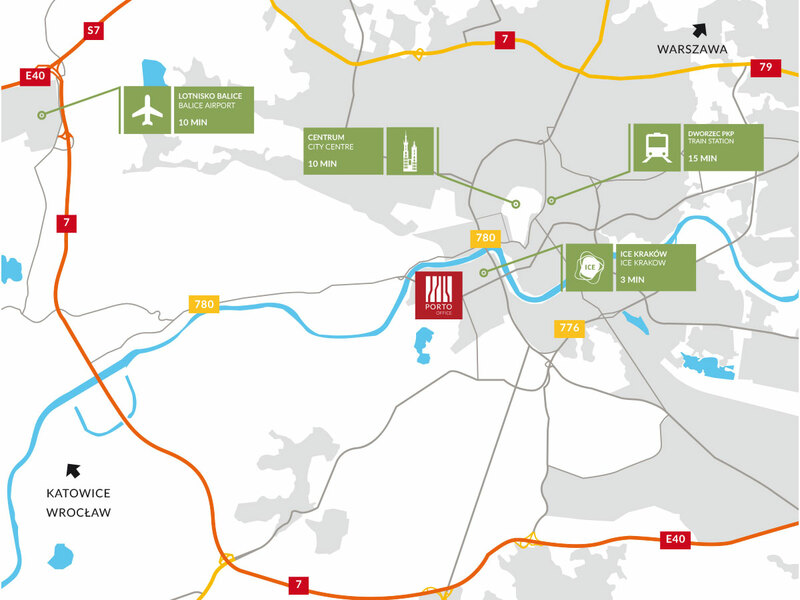 The intimate yet central location, supported by a very well-developed transport and road network that connects the complex with all major points on the map of Krakow, is one of the major advantages of the Porto Office project. In addition, the complex is located by a two-lane transport axis that connects with the inbound and outbound routes of the A4 motorway and the number 7 national road, as well as connecting it to the KrakowBalice International Airport. Eco fans will be able to use the excellent local public transport and the extensive network of bicycle paths in the area.